The wonderful and famous Lake Garda – in Italian Lago di Garda – is located in Northern Italy and is probably one of the most beautiful Lakes of Italy. With its breathtaking natural scenery it offers the perfect ambience for a romantic wedding in Italy! Beautiful, idyllic towns such as Torri del Benaco, Lazise or Malcesine build the ideal frame for unforgettable civil, protestant, catholic or symbolic weddings at Lake Garda. The small idyllic towns are surrounded by an absolutely beautiful landscape such as green olive groves, lemon trees and idyllic vineyards. Wih its mild Mediterranean climate and a matchless natural scenery Lake Garda is the perfect choice for a wedding in Italy and offers a huge number of multifaceted venues for unforgettable wedding ceremonies, receptions and parties. In the region around Lake Garda, you find many beautiful towns and the possibilities are virtually endless: you have, for example, the choice between a ceremony in the idyllic town Lazise, in lively Bardolino or in the authentic town Torri del Benaco. 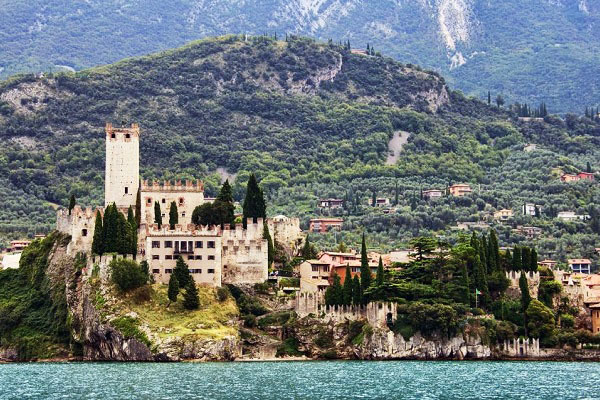 Also venues like elegant villas or glamorous castles like Castle Scaligero in Malcesine will build the perfect frame for your dream wedding in Italy! For the organization of your perfect wedding at Lake Garda, we resort to our longstanding experience as wedding planners and to our huge reliable network of contacts at Lake Garda. Thereby we focus above all on one thing: a very individual, tailor-made and perfect service for your glamorous and unforgettable wedding at Lake Garda!